The fantastic Mr. Grahm. The champion of the unsung vitis vinifera and decrier of the long over hailed vitis elieitist. The ever witty prolifcator of the written word, the masterfully poetic advocate of the unorthodox. The wild haired, be-spectacled, trail blazing, Rhône Ranging, entertaining, pontificating, elaborating, and stimulating, fantastic Mr. Grahm. Randall Grahm is many things. An author (Been Doon So Long), a restaurateur (The Cellar Door), a trendsetter (Rhône wines, screw caps, comic book ads), a provocateur (see items previously listed), a marketer, a father, and of course, a winemaker. 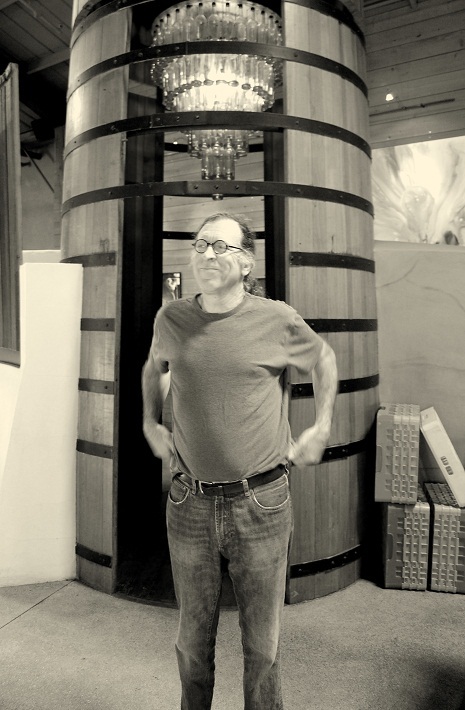 He is the name behind Bonny Doon Vineyard in Santa Cruz and the original Rhône Ranger. Grahm has released some of the most recognizable wines to ever go to market in the United States. At its height, Bonny Doon turned out over 400,000 cases of wine a year, including the magnificently popular Big House and Cardinal Zin brands. Grahm became one of the most discussed, debated, and well known vintners in California wine history. He was a celebrity in the wine world, a sought after lecturer, a renegade Rhône Ranger bucking the traditional marketing norms. He was both cheered and jeered as either a marketing genius or a rogue problem vintner, a thorn in the side of a pig (1,#). By most measures of success, he had been there; he had doon that, he had reached the top. He was Randall Grahm, and his name carried more weight than it implied. As a wide-eyed young man in the early 80’s, he set a path to discover a better course to “the classic American Pinot Noir”, his version of a quicker path to India. He imagined creating a beautiful New World Pinot Noir that tipped its dainty hat to the Old World brilliance of Burgundy. At some point, possibly after making a not so inspired Pinot Noir, or after some mid-night revelation of the cigar shaped UFO’s of Châteauneuf-du-Pape, Grahm decided it was not Burgundy but Rhône that would flourish on the coast of Northern California. In the years to come, he would become one of the most loyal and valiant defenders of Rhône wines in the New World, indeed in the entire World. His early efforts as a winemaker were met with some great successes, but in time he found himself drawn by the siren call of marketing into the rocky and dangerous waters of mass produced mediocrity. Bonny Doon had swelled in size. The success of brands like Big House and Cardinal Zin threatened to drag the once praised producer down into a sea of uninspired super market wines. It was as a ship with a “ginormous multi-tentacled unwieldly beast” attached to its hull (2) and the beast’s girth threatened to rip the ship apart. The path to India had been lost. Instead, they lapped the shores of an uninspiring New Jersey. A series of events (a child, a health scare) forced Mr. Grahm to take pause, if not completely reevaluate his place in the world, as well as his standing in the wine scene. His persona (3) as an eclectic jester and whimsical wine evangelist, which was perpetuated in part by much of his autobiographical-esque writing, superseded him as person as well as overshadowed his wines. The words had become in essence “more cleaver than the wine,” the packaging more brilliant than the contents, and his message of the importance of terroir was being drowned out by the “super generic” wines they had made a name selling. And so, about four years ago, Randall decided Bonny Doon had lost its way in the world and something would have to be done about it. For a time, he thought he would abandon the dooned ship entirely and let another Captain take the helm, beast and all. But like a portly debutante, suitors were lacking. Grahm came to realize that if the ship was to be saved, the beast would have to be vested, the demon barnacle removed. Bonny Doon and Randall Grahm would have to be born once again. He would have to slay the beast. Part of the dismembering of the beast came when the Big House and Cardinal Zin labels were hacked off and their fleshy parts sold at market. With the departure of the two big commercial brands, Bonny Doon, with her much lightened ballast, could begin the long and arduous process of correcting her wayward course. The goal would be to once again voyage in search of more favorable waters, waters that held the promise of wines of place, vins de terroir. In many ways, it was a remaking of both the brand and the man behind it. The wines Randall has loved and continues to love are the wines that speak of place, wines that show the earth they came from. He has devoted great amounts of time in championing the beauty and importance of terroir by way of his pen, but his own wines were terroir deficient. While the artistic hand of a creative winemaker can do many wonderful (and not so wonderful) things to a wine, it can also destroy the special qualities the earth can impart. The art, the manipulation, can mean the death of the place the wine was made, that is to say the earth it was born out of. If we are to say Randall is a creative person, and we must, then we can ask if his work to produce less manipulated and more natural wines required that he remove himself more so from the creative intervention in the wines life? It has been a lot to take on. 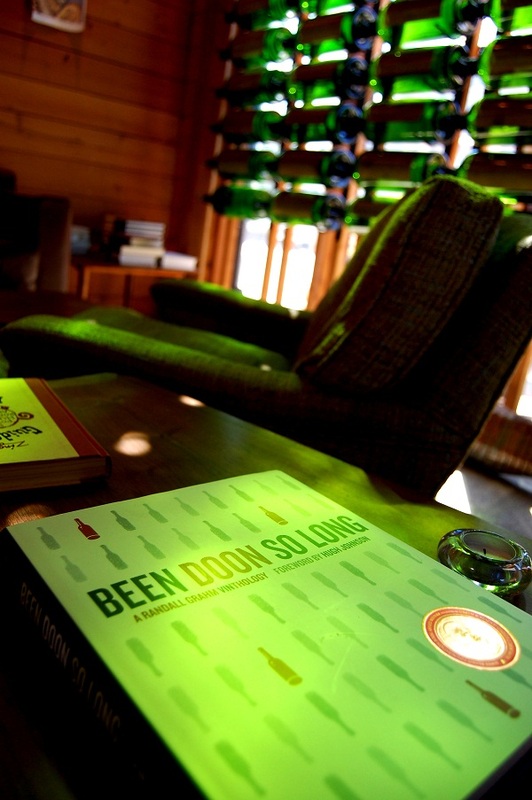 Bonny Doon shrank from roughly 450,000 cases to less than 40,000. It continues to shrink. Recently, they bought a property in San Juan Bautista, a little less than an hour to the southeast of Santa Cruz. There, the goal is to plant a future home for Bonny Doon, an estate vineyard where the tedious work of terroir driven wines can take place. I must confess, part of this Bonny Doon story leaves me feeling uneven in thought, even slightly vexed in the creation of this document. I am surprised by the level of personal reflection that the research and preparation for this tale has triggered in me and I do apologize for indulging in my own ramblings when you came here to read about Randall (I promise more words from Randall soon). I like to tell people I don’t have a set wine style that I am as open minded as a 20 year old at a Grateful Dead concert circa 1974. I live for the juice man, and no “machine,” no “institution” can take that from me man! I’m free man! But, can I truly love something I don’t stand up for, if I don’t have things that I can point to and say, “this is the right way, this is what I believe”? Randall can do that, he does do that. He loves wine. He fights for it, champions its cause. Take for example his love affair with the fair maiden Syrah. In an excerpt from his book Been Doon So Long, Grahm speaks of the stylistic changes Syrah has undergone (for the worse) over the last few decades, lead largely by the Australians and their ultraripe “Shiraz”. It takes courage of conviction to make statements like that, to denounce something so widely popular and well received. Above all, it takes the ability to believe in something passionately enough to speak out in defense of it no matter what others think. When I ask myself, “what do I believe about wine?” I have to admit I feel petty and silly for asking it. I don’t work in wine professionally, far from it. Isn’t it silly for me to evaluate it in this way, to make it so important and profound in my life? If you make your living from wine, it is profound, it is highly important. I get that. I don’t make any money from wine, and yet, I have spent countless hours writing about it. I have engaged in 40 or 50 hours of interviews. I have driven thousands of miles this year in pursuit of stories about it and spent a coin or two doing so. I once drove 12 hours in one day for an interview (the interview and tacos were great though). Just writing this paragraph makes me feel vain, small, and slightly less handsome than I actually am. Am I not simply over indulging in myself, in my own selfish pursuits? In a way, the answer has to be yes. To be sure, there is something about all of this extra work in my life that is worth the expenditures in time and treasure and the rest of the personal conflict I am sorting out as I go. While for winemakers their winery serves as a vessel for their love affair with wine, I have a couple of planks I nailed together called A Long Pour. I don’t even know if it is on the water yet, much less where that water will take me, but I am paddling. This could be why I am so intrigued by the voyage of Bonny Doon, for I am on my own in a way…or am I drifting aimlessly at sea? While there is much to learn for me, I am certain about one thing, the wine industry needs more winemakers to stand up and vocally say the way Randall Grahm has, “this is what I believe the right thing to do is.” Be it bio-dynamics, wines of nuance, wines of power, wines of place, or wines of style; more winemakers need to choose their causes and be champions for them. As for Bonny Doon, there is yet a long voyage ahead. I have to imagine that Randall Grahm and Bonny Doon will be polarizing topics in some circles for years to come. For as much as I may have presented myself as Grahm fan #1, I will not claim they are the ideal winery, the Nirvana of Nebbiolo, the Vatican de Vino. But they speak out to what is true to them and have done the hard work of self-evaluation and the harder work of doing something about their flaws. In the New World, this beautiful tradition called wine, handed down through the ages (4), has been under the threat of devouring for many years by the monsters of consumerism and profit. Their grotesque tentacles have already smothered much of what is beautiful about the noble fermented grape. In an age where the products we consume have more in common with an assembly line than the farmers market, it is refreshing to find individuals pushing back against “the system.” But it will take many hands to move the bloated beast of commercial mediocrity. So let a call go forth to all you winemakers of distinction, you winemakers of craft and purpose. Whether you make wines of nuance, or wines of carnal pleasure, grab each your weapon. Grab ye your spear, and ye your ax. Grab ye your knife and ye your sword, and set to the work of cutting through what oppressive beasts bind you. Be it the critic’s scorn, cut it off! Be it the market norms, cut it off! Be it your own comfortable complacency, cut it off! #. It should be noted that my use of footnotes is a direct result of ripping off Randall’s book. It is a challenge writing a story about a gifted writer and in some ways this piece is in respect an homage to his massive contribution to wine writing. 1. Some of the verbiage of this article sounds unduly negative for both Randall and Bonny Doon. While my experience with wine comes up short and I certainly would not consider myself in any way fit to be a judge of Bonny Doon’s choices over the years, I feel the tone of the article is a relatively accurate description of the state Randall felt Bonny Doon was in. This I ascertained in large degree from interviews Randall has done, from sitting with him, and possibly most importantly from his book Been Doon So Long, which in it’s opening pages reads at times as a confession. (2). Bonny Doon has always had a core group of well-respected wines (Le Cigare for one). These I see as making up the actual vessel and adding strength and stability to Bonny Doon. It was some of the other labels that constituted the monster, they were outside the normal portfolio, on the outside of the ship and like a great beast they certainly had a life of their own in the market place. This is not to say that were bad wines and in fact it was a Cardinal Zin that served as one of my first stand out wine memories, sometime before I contracted a full case of la vino insecta. The wild success of Big House and Cardinal Zin were destructive in the sense that they distracted and otherwise detracted from the core goals of Grahm and Bonny Doon. (3). The topic of the persona of Grahm is interesting. At the outset, I imagined he would be a larger than life jester. But after watching and listening to several interviews in preparation for our meeting, I was struck by how quiet and thoughtfully spoken he is. These enigmas persist in wine, be it of the reclusive genius (Adam Tolmach comes to mind), artistically brilliant cult leaders (Sine Qua Non, Screaming Eagle), or the eclectic mad man, they are often over-dramatized and romanticized by our projecting on to them who we would like them to be. (4). The word Kelter is a Middle High German word meaning ‘wine press.’ A Kelterer, as my last name is, is an occupational name for a vintner or the overseer of a wine press. At some point, before my Great Grandfather immigrated to San Francisco from Germany, my family was involved with the production of wine. This is a fitting and pleasing name for me and possibly explains my love of Riesling, as it may be in my blood. I would very much like to research this part of my family in greater detail. What is more, Wayne, when said with a thick Texan accent, a Mexico City accent, or by a drunk person, sounds identical to wine. I was born to do this stuff. 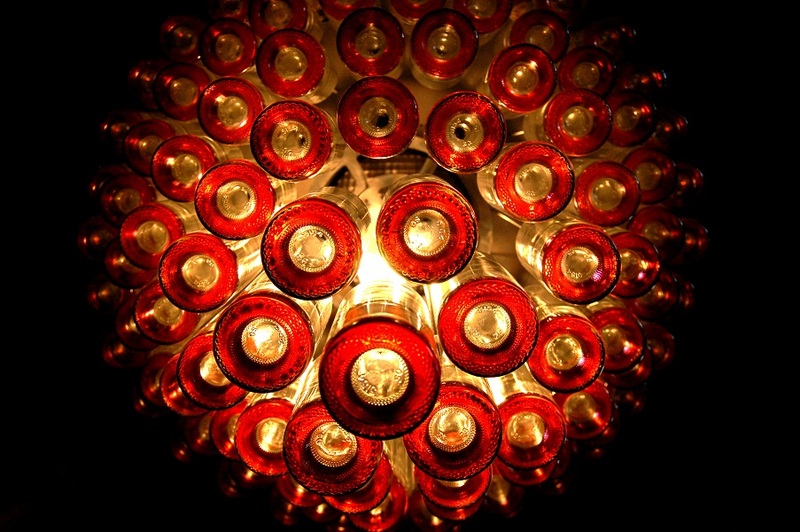 A beautiful shot of the light playing off of the wine bottles.